A new Google+ post from Daniel's Google+ page on this Friday, well besides the weekly gifs you can also find on his page. 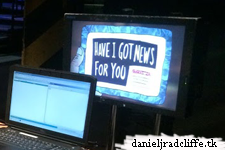 This time it's a photo of Daniel backstage at Have I Got News for You. The show in which Daniel is hosting for the second time was taped yesterday and airs tonight on BBC One. It's Dan backstage before taping HAVE I GOT NEWS FOR YOU.